Draft: 2012, Tampa Bay Rays, 9th rd. Originally selected by the Tampa Bay Rays in the ninth round of the 2012 First-Year Player Draft...Signed by Jayson Durocher…Attended the University of Arizona and Bishop Gorman (NV) HS...Participates in the annual BARCS Pet Calendar. 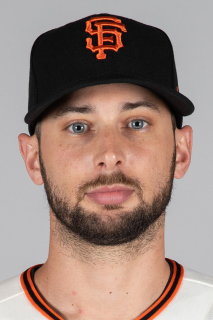 Recorded a career-high three outfield assists on 5/26 at TB; the third time in Orioles history an outfielder has had three outfield assists in a game (Joe Orsulak and John Shelby)...Hit his first lead-off home run of the season and the third of his career on 6/12 vs. BOS... Matched his career-high with five RBI on 7/28 vs. TB, second time doing so (5/13/18 vs.TB); also matched a career-high with three runs scored (fifth time in career)...Recorded his first career game with three extra-base hits (home run, two doubles) on 7/28 vs. TB...Recorded his first career triple on 8/9 at TB...Recorded a career-high eight-game hitting streak from 8/19-9/8; hit .393 (11-for-28) during this stretch...Recorded his first career multi-home run game on 5/13 vs. TB...Recalled from Triple-A Norfolk on 8/31...Hit .275 (42-for-153) with two home runs, 25 runs scored, and 27 RBI in 44 games. Made his Double-A debut...Scored a season-high three runs on 4/23 vs. Mississippi...Made starts in left field, center field, and right field...Recorded seven outfield assists. Spent the season with Class-A Bowling Green...Finished tied for the team lead in runs scored (79), second in total bases (185), walks (78), and third on the club with 63 RBI...Collected a season-high four RBI, 5/13 vs. Lake County...Slugged two solo home runs, 5/29 at Lake County...Batted .296 (24-for-81) with 19 runs scored in 22 June games. Named a New York-Penn League Mid-Season All-Star...Logged two hits in his professional debut for Short-Season A Hudson Valley on 7/9 at Auburn...Hit .358 (24-for-67) in 18 July games...Batted .364 (12-for-33) with RISP. August 31, 2018 Baltimore Orioles recalled CF Joey Rickard from Norfolk Tides. August 20, 2018 Baltimore Orioles optioned CF Joey Rickard to Norfolk Tides. July 4, 2018 Baltimore Orioles recalled Joey Rickard from Norfolk Tides. June 21, 2018 Baltimore Orioles optioned CF Joey Rickard to Norfolk Tides. May 13, 2018 Baltimore Orioles recalled Joey Rickard from Norfolk Tides. April 30, 2018 Baltimore Orioles optioned CF Joey Rickard to Norfolk Tides. April 28, 2018 Baltimore Orioles recalled Joey Rickard from Norfolk Tides. March 14, 2018 Baltimore Orioles optioned LF Joey Rickard to Norfolk Tides. September 1, 2017 Baltimore Orioles recalled Joey Rickard from Norfolk Tides. August 17, 2017 Baltimore Orioles optioned LF Joey Rickard to Norfolk Tides. April 28, 2017 Joey Rickard roster status changed by Baltimore Orioles. April 24, 2017 Baltimore Orioles sent OF Joey Rickard on a rehab assignment to Delmarva Shorebirds. April 9, 2017 Baltimore Orioles placed LF Joey Rickard on the 10-day disabled list. Left middle finger sprain. November 4, 2016 Baltimore Orioles activated RF Joey Rickard from the 60-day disabled list. August 31, 2016 Baltimore Orioles transferred RF Joey Rickard from the 15-day disabled list to the 60-day disabled list. Right thumb ligament injury. July 22, 2016 Baltimore Orioles placed RF Joey Rickard on the 15-day disabled list retroactive to July 21, 2016. Right thumb ligament injury. December 10, 2015 Baltimore Orioles claimed LF Joey Rickard off waivers from Tampa Bay Rays. October 15, 2015 OF Joey Rickard assigned to Leones del Escogido. August 2, 2015 CF Joey Rickard assigned to Durham Bulls from Montgomery Biscuits. May 7, 2015 CF Joey Rickard assigned to Montgomery Biscuits from Charlotte Stone Crabs. April 6, 2015 CF Joey Rickard assigned to Charlotte Stone Crabs from Montgomery Biscuits. March 9, 2015 CF Joey Rickard assigned to Tampa Bay Rays. September 2, 2014 Montgomery Biscuits activated CF Joey Rickard from the 7-day disabled list. March 28, 2014 CF Joey Rickard assigned to Montgomery Biscuits from Bowling Green Hot Rods. March 11, 2014 OF Joey Rickard assigned to Tampa Bay Rays. March 31, 2013 OF Joey Rickard assigned to Bowling Green Hot Rods from Hudson Valley Renegades. March 22, 2013 CF Joey Rickard assigned to Tampa Bay Rays. July 9, 2012 Joey Rickard roster status changed by Hudson Valley Renegades. July 3, 2012 Tampa Bay Rays signed OF Joey Rickard. July 3, 2012 OF Joey Rickard assigned to Hudson Valley Renegades.